This review is of the cut shown at the BFI London Film Festival in October 2017 – the UK release date is currently listed for January 12th 2018. The BFI London Film Festival is now done and dusted for another year, and in the short week and a bit it’s been going on I’ve been fortunate to see lots of exciting new releases that are destined for the awards circuit over the next few months. My absolute favourite of the bunch, in case it wasn’t obvious from the glowing review I gave it, was by far Guillermo Del Toro’s The Shape of Water, but if there were a film that came a close second, just for its powerful and often hilarious sense of humanity, it probably might be Three Billboards Outside Ebbing, Missouri. The third film by playwright and filmmaker Martin McDonagh is by far his strongest and most mature movie to date, and it does an awesome job at simultaneously giving us everything that’s to be expected from one of his films – the pitch-black humour, quirky characters, anecdotal dialogue, Zeljko Ivanek, and so on – while also taking his familiar traits to newer and more exciting places, making them feel fresh and interesting once more. Set in the quiet laidback town of the title, it’s been quite some time since the teenage daughter of Mildred Hayes (Frances McDormand) was raped and murdered by an unknown assailant, and in that time there appears to have been zero progress by the local police force, led by Sheriff Bill Willoughby (Woody Harrelson), in finding the culprit and bringing them to justice. More than a bit miffed, Mildred decides to rent out three giant billboards on the outskirts of the town, which display a message calling out Willoughby by name for his failure to investigate her daughter’s death, and in doing so igniting a mini-war between her, the entire police force – including the idiotic thug Officer Jason Dixon (Sam Rockwell) – and several members of the local community, who sympathise with her over her loss but not in this very public condemning of the respected Willoughby. An interesting twist this movie makes – one of many – is by not making Mildred feel at all like a victim, but rather the exact opposite; she is a bitter, spiteful and rather rude woman, often causing severe discomfort to those who dare cross her path, and in one brutal scene at the dentist’s even causing serious harm to others. You can feel the anger seeping out of her mouth with every word she spews, like she’s a walking embodiment of pent-up frustration that is just now being exhaled and is forcing unwitting standers-by to let such hot breath crawl down their skin. McDormand is an absolute force of nature in the role, as she also allows us to see that beneath the thick-skinned and vengeful woman is also someone who is still heavily grieving over the loss of their child, and just wants there to be justice for what happened to her. It’s among one of the actress’s finest roles since her Oscar-winning performance in Fargo, and certainly McDonagh’s most layered and three-dimensional lead character to date. The anger that Mildred feels throughout seeps its way into the moral centre of the film, but it never gets to a point where it’s overly mean-spirited or misguided in its values; rather, it helps serve a much greater purpose by highlighting the film’s themes of justice and the ability to forgive oneself before they can forgive many others. The billboards which Mildred displays her message to Willoughby are both a plea to the police force, but also a cry for help on her own part, and they serve as the catalyst for a much more personal journey where she will eventually learn to stop blaming herself for what happened – the reason why is shown to us via a brief flashback to an argumentative moment between mother and soon-to-be-slain daughter – and begin to open herself up to the feelings of others instead of throwing them back in their face. Likewise, Willoughby himself is having a hard time feeling comfortable in his own skin; as well as experiencing the growing pressure to get back on the case thanks to those billboards, he is suffering from pancreatic cancer and is at a crossroads as to what kind of person he wants to leave this world as. Dixon, too, has a huge arc in the film where he starts off as just this dumb and aggressive comic relief, but soon evolves into someone striving to do something a bit more meaningful with their life instead of just assaulting people he doesn’t like on the street. Harrelson and especially Rockwell do some of their best work here, as these characters who like Mildred are experiencing their own internal frustrations that are just now boiling at the surface. 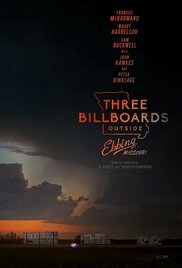 Three Billboards Outside Ebbing, Missouri is an excellent examination of anger and self-forgiveness that is not only excellently written and directed by Martin McDonagh, who makes his strongest film to date, but also exceptionally acted by its wonderful cast, including a never-better Frances McDormand and Sam Rockwell.